The Transportation Association of Canada (TAC) publishes its own Manual of Uniform Traffic Control Devices for Canada (MUTCD) for use by Canadian jurisdictions. While it is not compulsory for use, most jurisdictions adhere to the consistent application of traffic signage, road surface markings and signals design, installation and application in accordance with MUTCD. Consistent signage use is known to enhance safety and driver compliance with regulation. 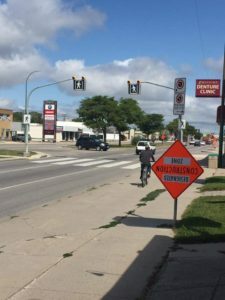 Does the City of Winnipeg conform to Canada’s MUTCD’s National Standards? as a requirement for all cities and municipalities in Manitoba.